and without gossip a quarrel dies down. so a quarrelsome person fuels a dispute. Gossip is disruptive talk and it soon becomes corrosive to us. It’s seductive yet destructive. Gossip—by nature—is in reference to someone other than the people engaged in either speaking or listening to the gossip. It’s seductive and destructive because it’s passing on personal, intimate, or sensational information about someone else at their expense. Think of how many TV shows, IG and FB posts, print and online magazines—across all forms of media—focus on inside scoops and dirt about celebrities, athletes, or even ordinary people. It’s mass voyeurism—a prying observer who is usually seeking the sordid or the scandalous. Why are we so consumed with knowing all this personal information about everybody else? Perhaps it’s a bit of FOMO. Somehow, missing out on what others may know matters to us. But think how long you or I have lived without knowing whatever it is we think we’re missing out on. In the end, it’s extraneous info—useless and unnecessary. I think the reason we’re seduced by gossip goes deeper than that. It’s a lot darker and more destructive. Consider what these few verses tell us. Without gossip a quarrel dies down. Just as a fire needs combustible material (wood) to keep burning, gossip fuels quarrels and stirs up strife and grief. Gossip can be defined as a rumor or report. Every time there’s breaking news all sorts of rumors and reports begin to circulate. Often, they’re unsubstantiated but they keep cropping up and circulating even after the truth dispels them. Some people still say the holocaust or the 9-11 terror attacks were hoaxes. But then, some people still think the earth is flat. A quarrelsome person is no different. Long after an argument is settled or dismissed, a quarrelsome person finds a way to keep it going. This is seen everyday on news talk shows—regardless of your political bent—on the Twitter-sphere, not to mention FaceBook…sigh. We would all do well to heed this admonition. Perhaps the darkest side of gossip is when it’s …swallowed greedily … into a person’s innermost being. This unneeded and destructive personal info gets buried in our hearts and corrupts us. It will cause us to see certain people in a bad light—destroying them in our eyes and corrupting us like cancer eating away at whatever is good and healthy in us. Why do we want to find fault or place blame? Somehow we’re deceived into thinking it makes us better than others. It doesn’t. It never will. When we put others down, it doesn’t elevate us, it does the opposite. But we’ve been doing this since the beginning of time. What can we do to stop swallowing this verbal junk food? It’s obvious what we need to do about generating gossip and quarrels. Shut our mouths. Just. Don’t. Pass. It. On. It’s really that simple. And, oh yeah—love covers over an offense, but whoever repeats the matter separates close friends (Prov 17:9 NIV). The reason we’re seduced by gossip goes deeper and is darker and more destructive than just a few words. It’s passed on at the expense of others and corrupts us like cancer eating away at whatever is good and healthy in us. If you find it too easy to listen to gossip and pass it on, ask God’s help to repent of this. Ask the Lord to help you shut your ears to gossip and quarreling, and to shun such corrosive and destructive thoughts and words. so a hastily spoken curse does not come to rest. or you will be like him. Opposites are not absolute and they’re not mutually exclusive, that is, they don’t offset or cancel each other out. Black and white are opposites but aren’t of equal strength, nor are they a perfect balance in the color spectrum. Black is an absence of visible light, while white is the presence of all visible wavelengths of light. Darkness as a quality of black—the absence of light—does not absorb or destroy light. Light disburses and shines in the midst of darkness, as displayed in a nighttime sky full of stars. The light penetrates the darkness. It’s a common thought that opposites either cancel one another or are held in some perfect balance in nature. But this is not true. Spring declares this in the cycle of seasons, as do vegetation and life from seeds buried in the ground. Good does not exist in a perfect balance with evil. At times, it may seem as if evil is stronger than good. But goodness will overcome evil. This is the theme of redemption—the existence of evil will come to an end. It is overcome by God’s goodness. Those who trust in God—true believers—have this hope in their hearts (Heb 6:19) and we are exhorted to overcome evil with good (Rom 12:21). the resurrection of Jesus from the dead is a testimony of this. Death is overcome by life. Evil is overcome and subdued by God’s goodness. Light is greater than darkness. Faith in God is trust—a confidence in God who is the source of light and goodness and life itself. This is why we don’t need to fear curses nor be bound by superstition. When someone expresses a curse on us, it only has power if we allow it to be stronger than God in our mind and heart. A hastily spoken curse has no power. Or, as it says in another version—it’s without cause. An illustration of this is found with Balaam the prophet who could not pronounce a curse on the Jewish people. Although paid to do so, he couldn’t unless the Lord originated it (Num 23:8). We are not to fear the curses or threats or insults of others. The Lord whom we trust is greater than those people and their words. We need to fear God who has power over our lives for eternity rather than the evil of people (Matt 10:28). Just as swallows and sparrows never seem to rest but dart and flutter and fly around—so are words spoken against us. Don’t take them to heart. Don’t allow them to nest in your mind. Trust in the truth of God—the One whom you trust above all. This brings us to what seems to be contradictory statements. Do we answer a fool with their own stupidity and foolishness or not? Which is it? It depends. The point of this paradoxical proverb is the need for discernment. An awareness and wisdom for the situation. At times, it’s best not to answer someone’s foolish talk, even when it’s directed at us. But sometimes foolishness needs to be confronted with the truth. How can we know which to do when? There is no trustworthy formula or grid to figure this out. No set answers. We need discernment and wisdom. We need to be aware of the situation and alert to what the Spirit of God stirs in our heart and mind (Matt 10:16-20). The one thing we don’t want to do is react. We are not to be driven by dogma nor controlled by our emotions. I see this too often in social media and it accomplishes nothing good. Here is where discernment needs to lead to discretion. The noise of the world around us can get loud. And so are the voices competing for our attention. Everyone seems to have an opinion and feels entitled to express it. But at what cost? And what value does it really hold? The short of it is this—people of faith are not at the mercy of the world’s whimsical wisdom because we can draw from the source of true wisdom, God’s wisdom. So let us live accordingly—guided by the Lord’s wisdom with discernment and discretion. Evil and foolishness are overcome by God’s goodness and truth. When we rest in the wisdom of God and rely on His Spirit, we can learn when and when not to answer the voices of those around us. We can live as a living testimony of His goodness. When you find yourself plagued with harsh words, ask the Lord to direct you in His Word—the Bible—to counter them with the truth. When confronted with foolishness, pray for discernment and wisdom and discretion. and searching for honor is not honorable.Hebrew meaning of this line uncertain. We live in a binary world. Consider how pervasive computers are—huge main frames, desktops, laptops, and handhelds. They all work off a sequence of zeros and ones. Ok, it’s not quite that simple. A programmer may use different ways to configure things—different programing language or code—but it boils down to manipulating a sequence of zeros and ones to execute some action. Think of the countless decisions you make in a day. Most decisions are yes–no, either–or. Others weigh the pros and cons of a decision. Still binary. And there’s the classic—Are you a glass half-full or half-empty person? Why is life in this world so binary? I track it back to the decision in the garden to eat of the Tree of the Knowledge of Good and Evil. Even that decision was a choice between—Do we continue to trust God or believe this clever talking serpent? They chose the second option. They chose the lie. What does all this have to do with these two verses? Each of us struggle to find the somewhat neutral ground of contentment between too much or too little. Why is this so difficult? Because our self—our ego—our basic nature—never seems to be satisfied. This leaves us open to making poor decisions, pursuing empty promises, or drifting along through life. Both proverbs are explained with simple illustrations of comparison. We know what it’s like to have too much of a good thing. It’s not good. In an earlier verse (Prov 25:16), we’re told eating too much honey makes a person nauseous. You know the feeling of eating more than you should because it tastes so good—a 2nd or 3rd helping or a rich dessert after a big meal. This applies to more than eating. It’s great to get some sun but too much will make you sick or sunburned or both. We all want and need honor and respect. The opposite would be shame or contempt. No one enjoys shame or contempt. When others honor and respect us, it’s a good thing. But when we pursue our own honor or glory, it’s despised by others and tends to bring embarrassment, shame, and disrespect on us. It’s not hard to imagine an ancient walled city with broken walls. You’ve either seen it in photos, movies, or digital games. If not, recall the story of ancient Jericho’s walls tumbling down after Israel’s army marched around it for seven days (Josh 6:20). It would also be similar to the destruction a tornado, hurricane, or earthquake brings. Imagine being in a house where the walls and roof are blown away or broken down leaving you vulnerable to the elements, wild animals, or scavengers and looters. This is the picture of someone who lacks self-control. We’ve seen what this brings in the life of others and perhaps in our own life. A lack of discipline leads to many problems—over-eating, over-spending, little to no exercise, too little sleep, and so on. A lack of self-control can lead to things like addictions, broken relationships, excessive worries, poor health, and on and on. How can we escape the back and forth struggle between too much or too little? Contentment comes with trusting the Lord. Trusting Him instead of our self. We need help with who we are and how we’re wired internally. Later, in the New Testament book of Galatians, the apostle Paul speaks of this struggle (Gal 5:16-18). He goes on to say the evidence of relying on our self is obvious (Gal 5:19-20) but when we rely on the Lord—His Spirit in us—we gain self-control and a lot more (Gal 5:22-23). 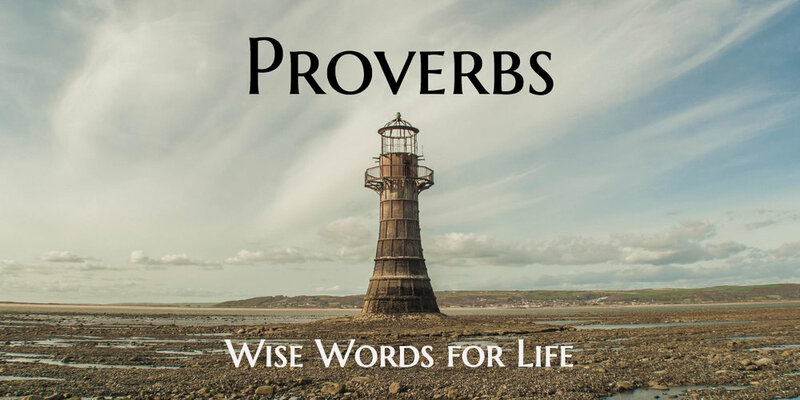 The book of Proverbs is intended to help someone gain wisdom and develop self-discipline. This isn’t about self-improvement or self-reliance but entrusting our self, our decisions, and our deepest needs to the Lord. Contentment comes with trusting the Lord rather than our self. We don’t need to improve nor rely on ourselves but entrust our decisions, deepest needs, and life to the Lord daily. When you find yourself caught in the tension between too much and too little, call out to God in prayer. Ask His help with decisions before you make them. He knows your deepest needs, so look to Him as your source of honor and respect—He knows you better than any person on earth. Polarized. This is the common and current description of American society. Where various groups of people are pitted against each other as archenemies. But the sense of polarization among people or within a culture is nothing new. Perhaps the news media, the internet, and social media heighten our awareness of it. Even contribute to it. And, some of the reactionary rhetoric fans the flames higher than needed. But enemies—perceived or real— have existed since the beginning. The serpent in the garden of Paradise was no friend to God or the first humans (Gen 3:14-15). It appears Cain viewed is brother Abel as an enemy of sorts. Cain perceived God honored his brother over him, so he killed him. Some people become our enemies because of nationalism, jealousy, economics, politics, religion, ambitions, and a variety of other reasons. These enemies can be real. They want to harm us, even destroy us. Other people we perceive as enemies. Perhaps for one of the previous reasons given but more often it’s because of personal slights, insecurities on our part, or a difference of opinion. During the anti-war, anti-nuke protests and love-ins of the sixties, a popular slogan was—Make love, not war! Maybe in our polarized times we can start a new slogan to depolarize things—Make friends, not enemies! Both slogans may seem idealistic and naive but they echo similar conduct esteemed in preschool and kindergarten. Not only were we encouraged to share toys and such, but when some conflict erupted we were challenged to “say you’re sorry” and shake hands or hug. Again, maybe this seems too naive and idealistic but this is the intent of these verses in Proverbs. The idea is to turn an enemy into a friend or at least defuse or deflect the animosity of an enemy. Taken literally, this doesn’t seem to be an effective way to make a friend of your enemy. But there’s at least a couple of thoughts on this. Taken literally, the inference is one person lending their “enemy” burning coals to start a cooking fire with much less effort. They would place the burning coals in a pot carried on the head of the other person. But figuratively and most likely, it refers to the effect of a person’s kindness to an enemy. It brings a sense of conviction, perhaps shame for the enemy’s spiteful attitude. Jesus referred to this in His sermons on the mount in Matthew (Matt 5:43-48) and on the plain in Luke (Luke 6:27-31). This is tied to the Golden Rule to—do unto others as you would have them do unto you, and to the merciful nature of God. I’ve learned the effectiveness of this approach first hand from my wife. She’s done this many times with me when I’m in one of my antagonistic moods. I’ve watched her successful use of this same strategy with feuding children, disgruntled staff, and quarrelsome people in our ministry in the US and abroad. This is a simple way to turn enemies into friends or at least defuse their combative attitude. But, it’s also difficult. What makes it difficult is our part. It requires us to be peacemakers—to humble ourselves, choose reconciliation instead of revenge, and trust in the Lord to honor our effort. So, feed your enemy when he or she is hungry. It they’re thirsty, give them some refreshing water. Be a peacemaker. It’s one of the ways we show ourselves to be true children of God (Matt 5:9). Who knows, we just might bring some depolarization to the world around us. God’s people are called to be peacemakers—to do our best to defuse and deflect antagonism from others. It requires humility and choosing to trust in God. Are there people who have slighted or wronged you? People you dislike because of their opinions, or what they stand for or who they are? Then, ask the Lord to help you see them with His eyes and to help change your heart to become a peacemaker. What makes something valuable? Is it scarcity? This is the prevailing and popular belief. But scarcity creates a temporary value not a lasting value. Lasting value has worth because of intrinsic qualities. Qualities that endure cultural fluctuations, people’s opinions, and time. Words are valuable when they have an enduring sense of worth. What’s spoken or written isn’t dependent on their situational context or timing. We live in a day and age when words—written or spoken—have little value. They’re neither scarce nor worthwhile. An advertising slogan goes, what happens here (said city), stays here. If only this were true about what’s spoken and written on the internet! What gets posted online lingers on long after its initial arrival and eruption in the public forum and can’t be extracted or erased. How do words become valuable? How can words become valuable? They need to have intrinsic and enduring worth. Valuable words are true regardless of their situation or time. Truth—pure truth—endures. Its value lives on because it’s untainted. A precious metal gains value when impurities are removed from it. This requires intense heat and sifting out the dross that collects on the metal’s molten surface—what’s common, corruptive, and invaluable. When a precious metal such as gold or silver is purified, it becomes mirror-like in its molten state and reflects the image of whoever looks into it, such as the one who refines it. The purity of the silver sets off the purity and beauty of the golden apples. The pure silver frames the gold in a refined and reflective way. If we want to speak or write valuable words, they need to be true and free of impurities. So, if we want to speak valuable words then our hearts need to be pure. Our motive and intent for saying something needs to be pure—free from bias, malice, jealousy, or other such things. First, the truth of God needs to be valuable to us—as if it were a precious metal or jewel. Then God’s word of truth needs to find an abiding place in our hearts. We need to treasure it.eLikewise, the truth needs to be prominent in our minds and on our tongues. This requires reading and speaking the truth of God so it impacts and refines our thinking. When we love the truth it will become evident to others. Even truthful and constructive criticism—though hard to hear—will be welcomed for its value. But keep in mind—only God is able to purify our hearts. He is the master Refiner of hearts (Mal 3:2-3) And God’s Spirit brings to life and reveals the truth of God to us (John 16:13). When the Lord does His work in us and we reflect Him to others through our life—our words will become valuable when spoken at the right time. The truth of God needs to be valuable to us and abide in our hearts, and be prominent in our minds and on our tongues. We need to treasure it. If you know your words aren’t always beautiful and valuable to you and others, or don’t reflect and honor God, ask the Lord to give you an understanding of the value of His truth. Then ask God to help you love the truth in a new and fresh way.